This EOD Stick is battery powered to manipulate the grabber. 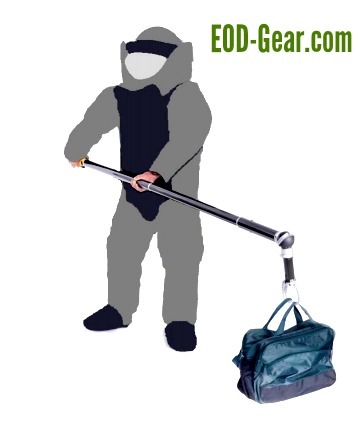 This EOD Hot Stick is the Dexter HS500 and extends out to 12 feet giving you a little more standoff and the best manipulation available when moving a suspicious package. This is the premier EOD Hot Stick used by top EOD and Bomb Squad Commands around the world. When you need to Grab, Move or Lift, don't rely on brute force but the exceptional ease found in the HS500. Command and Quanity discounts are available. Be sure to ask for an RFQ!